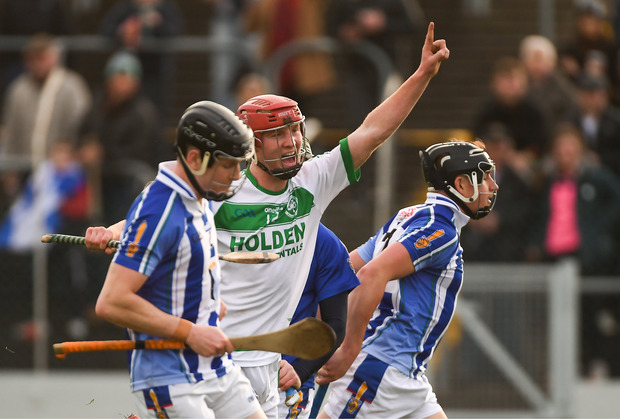 Ballyhale Shamrocks extended their remarkable record to nine Leinster club titles with a convincing victory over Dublin's Ballyboden St Enda's at Netwatch Dr Cullen Park. A dominant second-half display, aided it should be said by a day that turned really nasty in Carlow, carried the Kilkenny champions to a far more comfortable victory than had been anticipated. Sadly for Ballyboden, their hopes seemed to die as the skies blackened and a virtual tempest began blowing into their faces for the start of the second-half. Even with the benefit of the wind, Ballyboden had the kind of start they were probably dreading, conceding an eighth minute goal to Adrian Mullen after good preparatory work by Eoin Reid. But the resilience that franked their progress to this final was in evidence again as they outscored the Kilkenny champions by 0-7 to 0-3 over the next sixteen minutes to draw level. Ballyhale were doing most of the hurling, but their wides tally was accumulating at a rate that had to worry manager, Henry Shefflin. By the time, Aidan Mellett registered Ballyboden's first wide in the 25th minute, their opponents had already leaked eight. And by the mid-point that tally would have slipped into double figures, albeit Ballyhale got the last four scores of the half (three frees from TJ Reid and a point from his brother, Eoin) to go in at the break with a four-point advantage (1-9 to 0-8). The one major source of optimism for Ballyboden was a suspicion that Colm Basquel had the legs on Joey Holden if the right ball was deliuvered to the edge of the square. Basquel, who scored 3-3 in the semi-final, scored two points off Holden in that first half whilst operating essentially on crumbs. But those crumbs all but disappeared as Ballyhale took complete control in the second-half and their victory was assured when Mullen rifled home his second goal after being set up by substitute, Mark Aylward. Ballyhale's All-Ireland semi-final opponents in February will be Munster champions, Ballygunner. SCORERS: Ballyhale - TJ Reid 0-9 (0-8 frees), A Mullen 2-1, E Reid and E Cody 0-3 each, C Fennelly 0-2, E Shefflin, M Fennelly, R Corcoran 0-1 each. Ballyboden - P Ryan 0-5 (all frees), C Basquel and N Ryan 0-2 each, S Durkin, N McMorrow 0-1 each. BALLYHALE SHAMROCKS: D Mason, B Butler, J Holden, D Mullen, E Shefflin, M Fennelly, R Reid, C Walsh, R Corcoran, A Mullen, TJ Reid, B Cody, E Reid, C Fennelly, E Cody. Subs - G Butler for Walsh (38 mins), M Aylward for Cody (50 mins), J Cuddihy for E Reid (53 mins), K Mullen for Butler (56 mins), P Mullen for Corcoran (56 mins). BALLYBODEN ST ENDAS: G Maguire, D O'Connor, L Corcoran, J Madden, S Lambert, D Curtin, D Curran, S Durkin, S O'Connor, C Keaney, C Dooley, N McMorrow, A Mellett, C Basquel, P Ryan. Subs - N Ryan for Dooley (32 mins), P Doherty for Mellett (35 mins), F McGarry for Curran (47 mins), C McCormack for D O'Connor (53 mins), M Travers for S O'Connor (55 mins). Referee - P Murphy (Carlow).